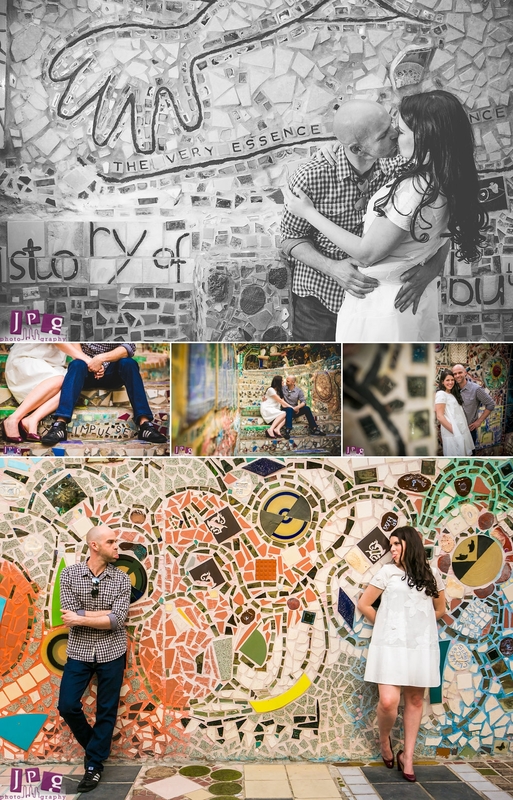 “It was right over here,” Kate said as she led the JPG Photography team towards one of the many colorfully tiled staircases at Philadelphia’s Magic Garden on South Street, “This is where we took a picture together on our first date.” Kate and Zac sat down on the same stairs they did years ago, and looked towards our cameras as we began capturing the updated version of the special photo. We’ve put the two side-by-side below, from day one to being engaged, to showcase how beautifully the couple has grown. 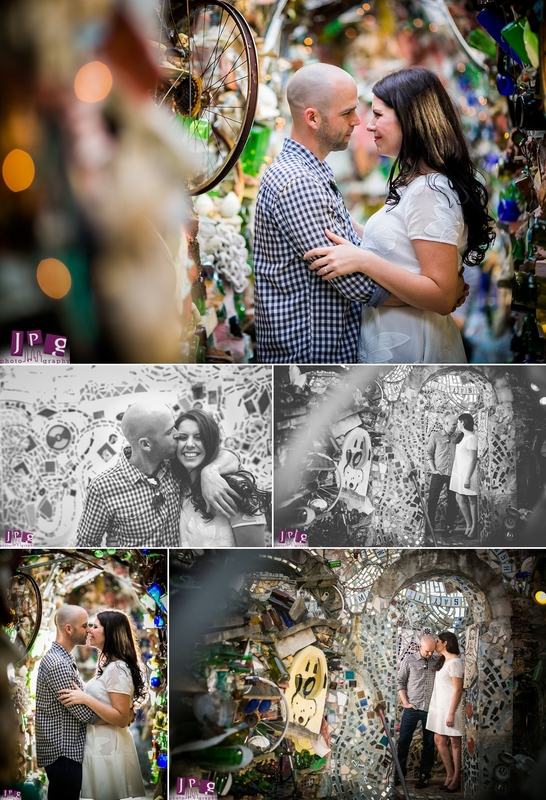 The photo’s location is eclectic and exciting on its own, but knowing that Kate and Zac’s story began here makes this Magic Garden engagement session even more meaningful. I could shoot in the Magic Garden every day of the week. At every turn, your eye is met with color, texture, and funky artistic accents. We utilized the scene with all of its quirks and intricacies to create interesting compositions. Kate and Zac are framed by lights, illuminated in fragments of mirrors, and juxtaposed beside vibrant walls. When it came time to head to the next location, we literally had to pry ourselves away from this abundant source of inspiration. Luckily, the trade off came in the form of donuts. We’ve said it before and we’ll say it again that no trip to Reading Terminal Market is complete without a stop at Beiler’s Bakery. Here, we documented our couple perusing the flavors (we say go for salted caramel and oreo), and sinking their teeth into the delicacies. 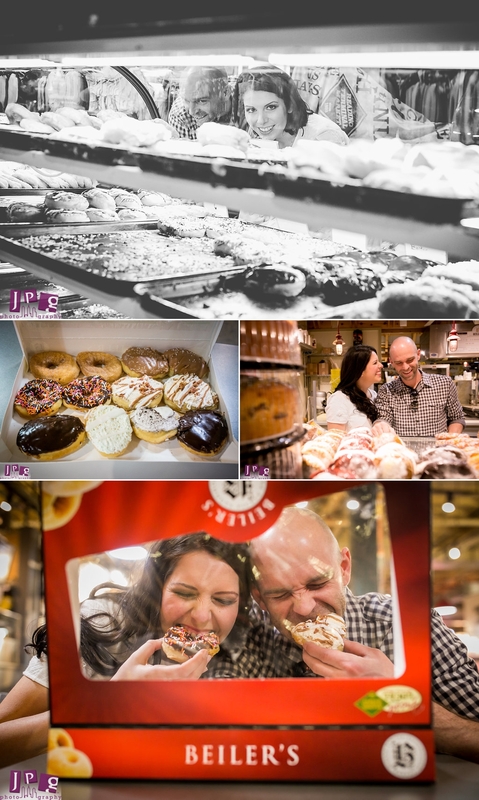 The shots from this series are fun, candid, and make me want a donut every time I look at them. Our session ended outside during the golden hour, with serene images around the art museum. The couple snuggles up wrapped by spring branches and exchanges kisses underneath a stunning sunset. 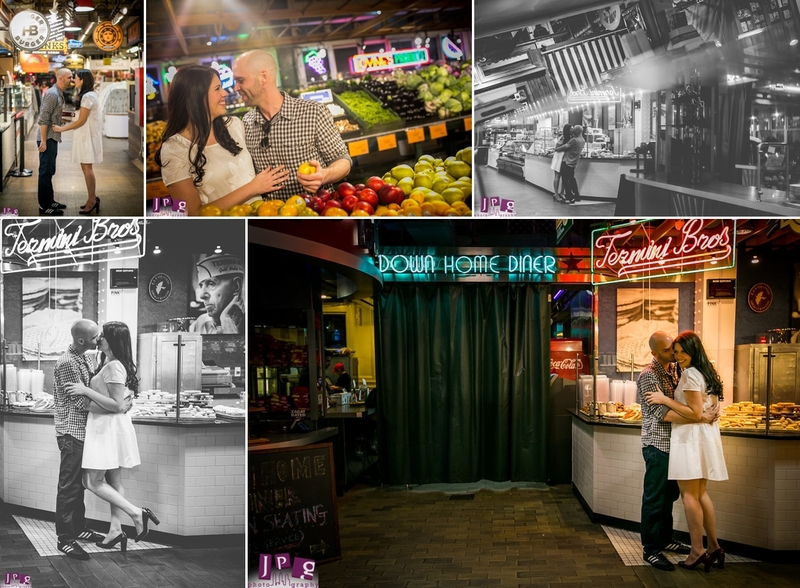 The session exemplifies the versatility and variety that JPG Photography loves. We are perfect for couples seeking a little adventure and who enjoy fun, unconventional images. Bonus points for all those who love donuts. Kate and Zac, thank you so much for the fun session. We are looking forward to your wedding! 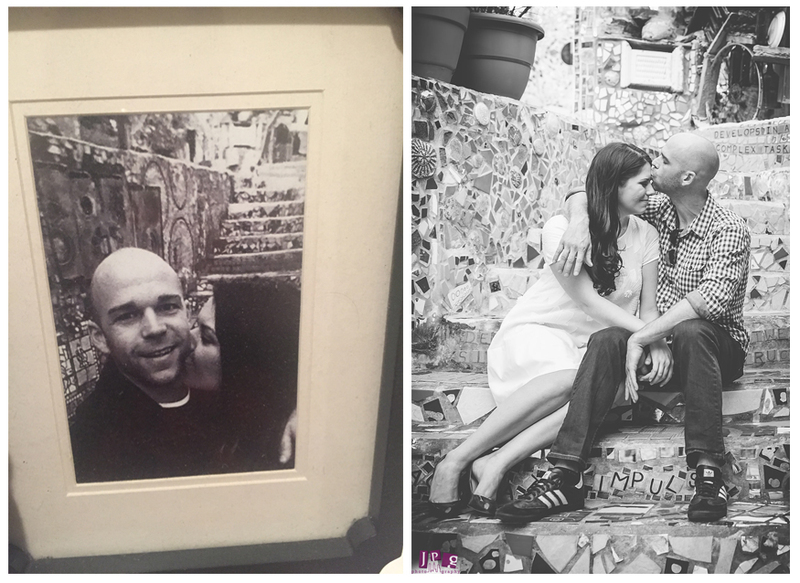 Kate and Zac exchange kisses at the same staircase in Philadelphia’s Magic Garden on their first date (left) and at their engagement session (right) with JPG Photography.